April 20 is always close to being the peak of the spring songbird migration through south Texas. Unfortunately, this spring a constant, southerly wind carried most of the birds right on over us. It was last week, early May, before a “fallout” finally occurred at South Padre Island. It was a little late to see great numbers of birds, but three days of brisk north wind forced a nice diversity of birds to seek refuge on the island. It was a wonderful photography event! Click on the photos to make them open in a larger, sharper format. American Redstart male twitching about in search of a bug. I saw more redstarts at South Padre Island last week than in the past ten years combined. 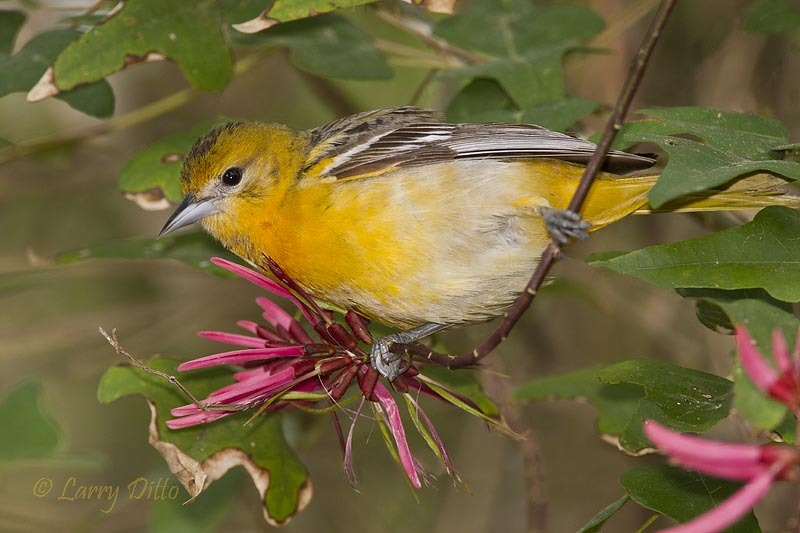 Female Baltimore Oriole feeding at Coral Bean flowers in the South Padre Island Convention Center thicket. 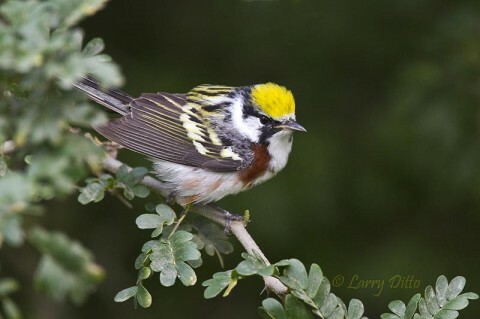 This Chestnut-sided Warbler's urgent need for food brought him within my arm's length on several occasions. 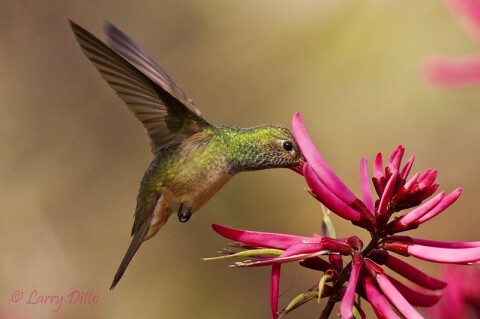 A Buff-bellied Hummingbird taking its turn at the Coral Bean blooms. Most of these photos were taken with the Canon 7D camera (set for high speed shutter action…8 frames/second), a 500 mm IS lens, 1.4X teleconverter, ISO between 400-1,000 depending on the light, while maintaining something close to 1/2,000 second shutter speed @ f 5.6 – f 11. Most of the time, I was using fill flash with a Better Beamer attached. I almost always shoot with flash power reduced – 2 2/3 f stops from full power. For shooting songbirds, I recommend using a 25 mm extension tube between the lens and camera to allow extra close focusing. Mine was on the blink last week, but a good cleaning revived it. *One of the pins was sticking and couldn’t spring into normal alignment as the extension tube was attached to the lens. Remember that when yours decides to fail. 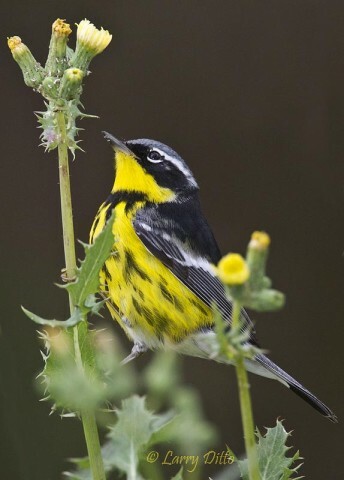 Bay-breasted Warblers are always scarce at South Padre. This one gave me several shots, but it never looked at the camera. 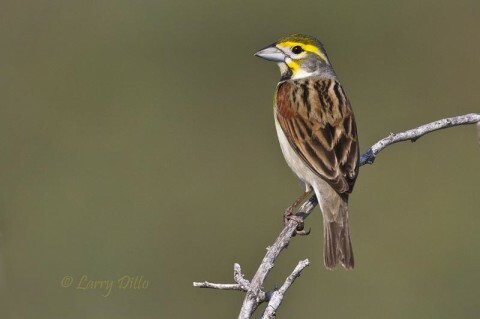 One of a flock of tired Dickcissels arriving at the South Padre Island Convention Center as we unpacked our photo gear. I saw a flock of Dickcissels arrive as I was getting my gear unpacked for an afternoon shoot. They were so tired I was able to move in for a close-up before they whirled away. 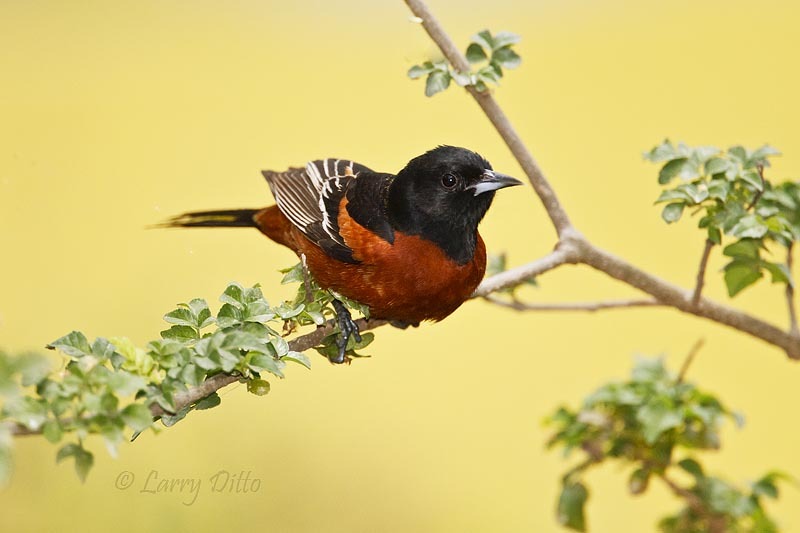 A male Orchard Oriole ready to launch. Magnolia Warbler male searching a thistle plant for insects. Magnolia Warblers in spring plumage have always been my favorite. 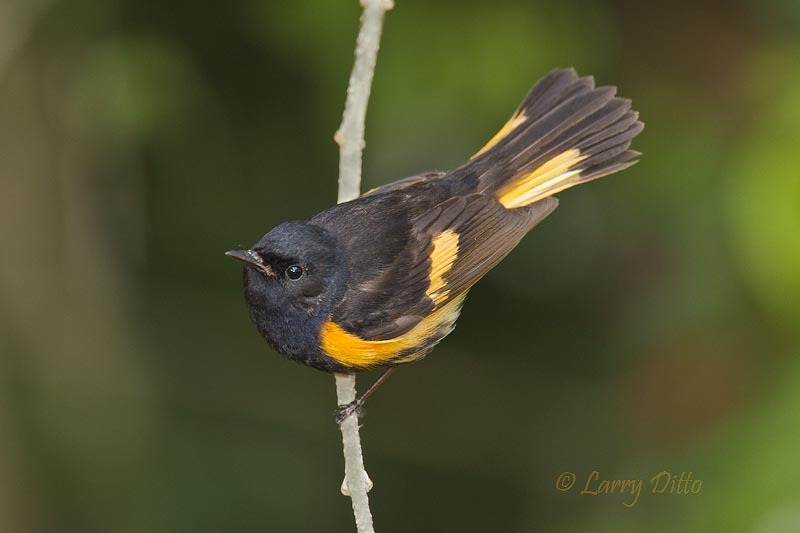 Their contrasting yellow and black plumage and black necklace are striking. This bird returned to the thistle plant on several occasions and even hovered long enough for this photo. 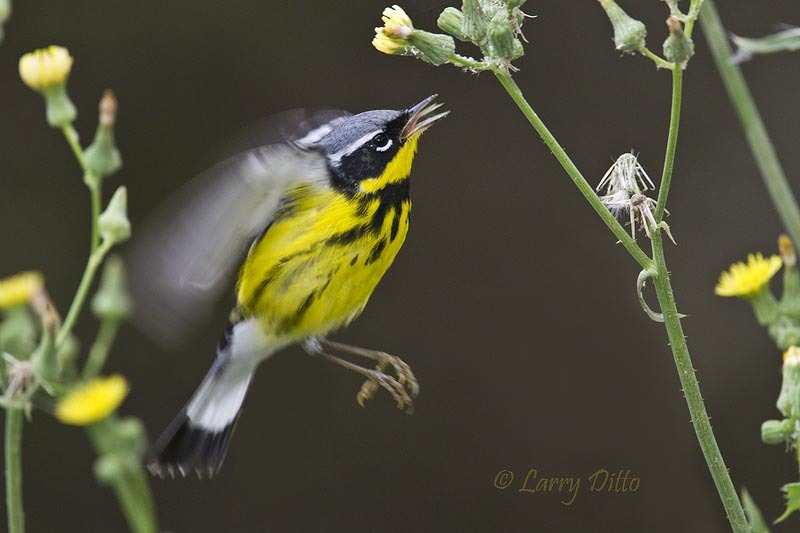 Magnolia Warbler hovering at a thistle bloom while picking off insects. 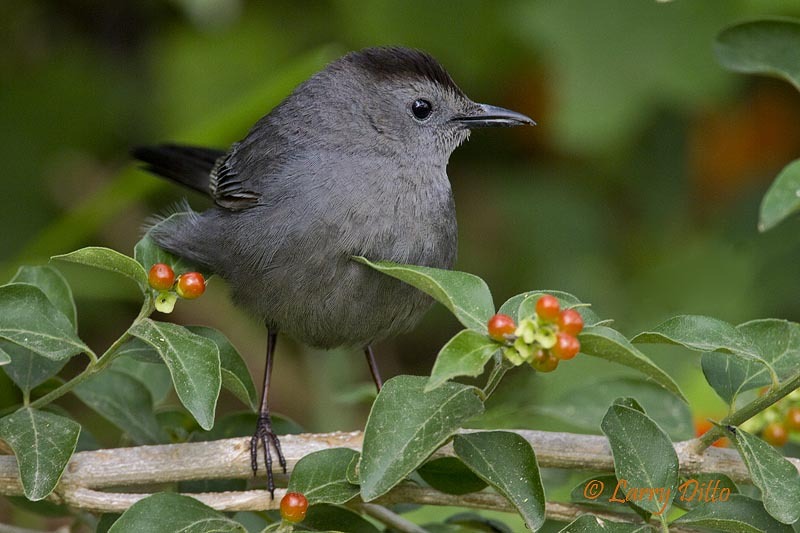 A Grey Catbird in search of ripe Berlandier Fiddlewood fruit. Ruby-throated Hummingbird male feeding at sunset. 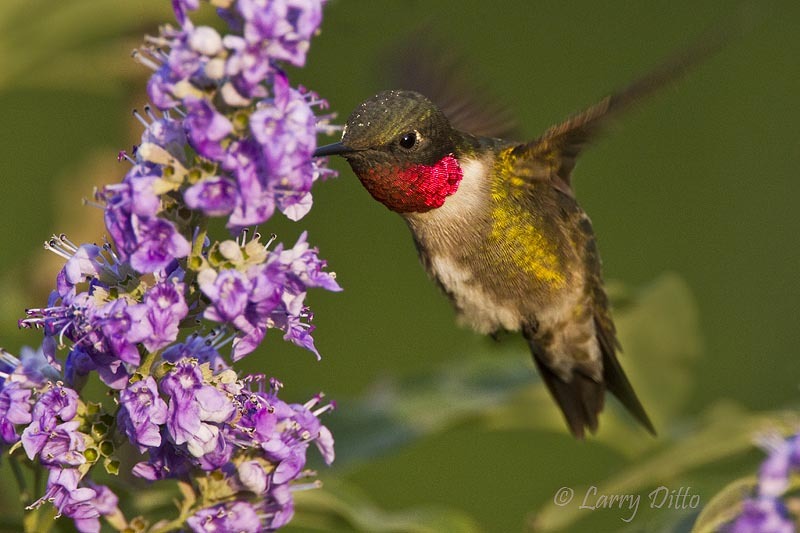 Each time this male ruby-throated hummingbird came in, I blazed away, trying to capture that incredible throat at a good sun angle to bring out the irridescent red. Just before the sun set, I got the shot. 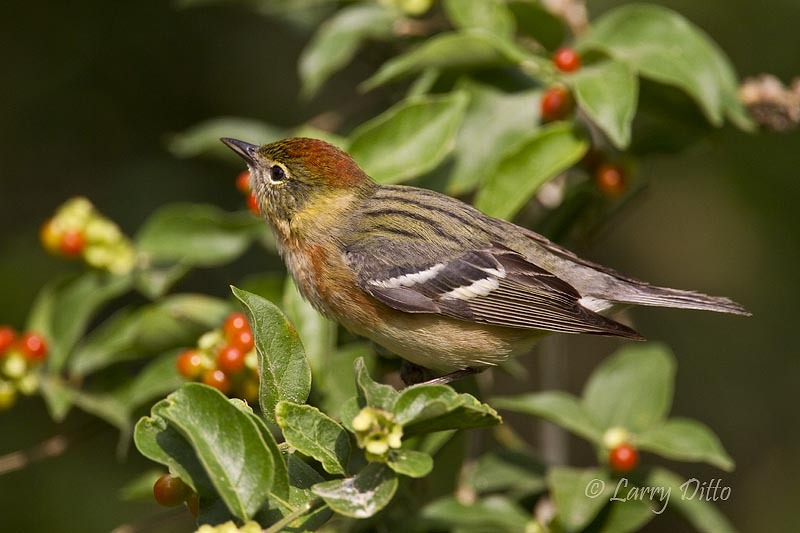 Two days later, Steve Bentsen and I spent a morning on his ranch trying to call birds with another friend, Richard Moore. A little after sunrise, we got this Black-tailed Gnatcatcher. The rest of our trip was a dry run, so assumed that the extremely dry weather is causing many species to delay breeding. 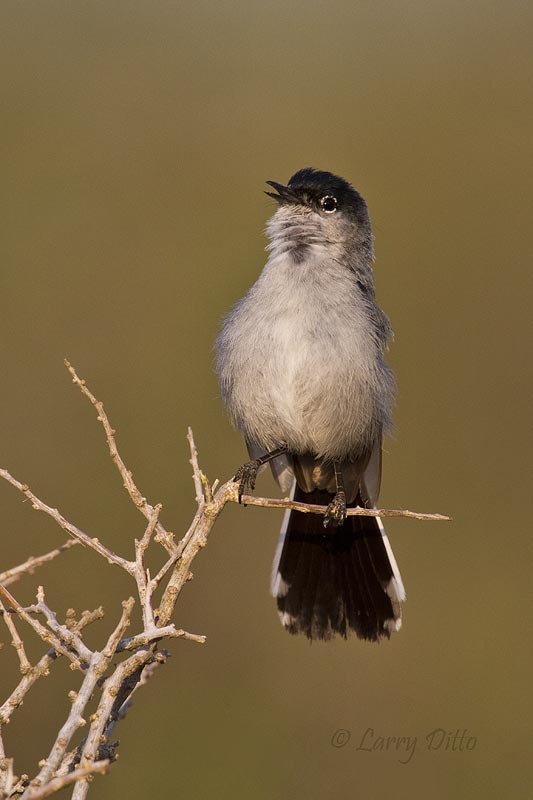 It is critical to position the camera to capture a bird in front of a smooth, clean background. This gnatcatcher wouldn't land on "my" perch, but he did land in front of a nice background. I am thankful for that one “fallout” this spring and for having the chance to photograph it. It is a thrill to share the experience with others who appreciate nature’s beauty.